This is where I post updates about new services or products I am offering along with details of my CPD and anything else directly related to the clinic and me as a practitioner. Studies of identical twins have established that genetics contributes about 30% of disease whilst environmental factors account for the remaining 70%. Environmental factors include toxins, infectious agents, physical trauma, sleep patterns, stress, exercise and diet. Of these diet is by far the biggest environmental factor affecting general health and is also one of the most easily modified. And whilst we manage to avoid traumatic injury and infectious disease through most of our lives no one avoids eating for long. One of the biggest breakthrough’s in the last two decades has been an understanding of epigenetics – the study of how environmental factors can switch genes on and off. Some of these changes are passed on to offspring, meaning that your parent’s diet influences your health and even the health of your children – which is one of the reasons I ask new patients about their family’s health and diet. The ability of diet to modify health at the gene expression level is illustrated in the following experiment. 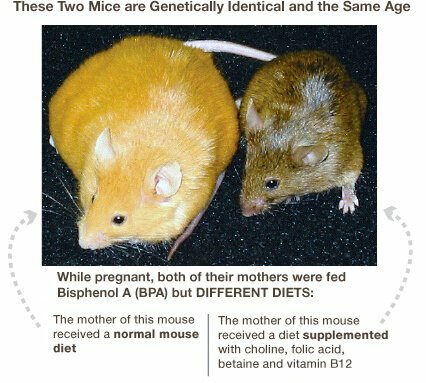 Mother lab mice were fed a toxin, bisphenol-A (BPA) which is found in polycarbonate plastics. This induced epigenetic changes in the offspring, making them obese and tending to have a yellow fur colour. This alone is a good example of how environmental factors (toxins) can effect health. What is really interesting is that when the experiment was repeated, but the mother’s diet was supplemented with methyl rich foods (e.g. high in choline, folate & B12) the offspring were more likely to be normal coloured and healthy. In other words the diet was able to undo the damage caused by the BPA toxin. Studies like these make it clear that diet is pivotal in health management – something that most doctors and their patients have yet to appreciate. My job is to stay up to date with the science so that I can provide targeted, evidence based dietary advice for my patients to help them get on top of their health. The science on nutrition and health is advancing with enormous speed. Keeping up with it all takes a considerable amount of time and energy. I read hundreds of scientific papers each year as well as attending dozens of live and online seminars. One of the reasons I write a nutrition blog is to help me assimilate and link up some of the new information. There are many popular diets that appear in the newspapers and get celebrity endorsements such as the Paleo, Zone, South Beach or DASH diets. These are often promoted in the media as weight-loss or ‘healthy’ diets and are often over-hyped one month only to be knocked down the next, leaving the public bewildered and sceptical. In my work as a clinician such a superficial understanding has no place and I certainly do not promote any one diet as a the Ideal. People are far too individual for that. Ketogenic Very low carbohydrate, very high fat Neuroprotective. Used to treat intractable epilepsy, brain trauma, neurodegeneration and as an adjunct to cancer therapy. Role in mitochondrial conditions, endurance sports and diabetes. Atkins Low carbohydrate Can provide some of the benefits of the ketogenic diet but is less restrictive. May be used as a follow-on diet for recovering epileptics and diabetics. Casein-free, Dairy-free Zero milk products As for gluten-free. In mild cases switching from cow to goat and sheep products can be enough. Omega 6/3 balancing Reduced use of vegetable oils, increased fish, grass-fed meat, flaxseed Helps in inflammation, reproductive disorders, brain development. GAPS Elimination diet often starting with bone broth An approach suitable for autism spectrum and other conditions that involve the gut-brain axis. Also effective in difficult cases of Crohn’s and ulcerative colitis. Despite having their own names these diets are not used in isolation and often a combination of several diets will be necessary. For example a gluten-free diet consisting of gluten-free bread, cakes and biscuits, will have a very different effect to a gluten-free Mediterranean diet based around fresh ingredients. My dietary recommendations will depend on the individual condition, symptoms and background, and can be informed by lab tests (e.g. genetic testing, organic acid test and food reactivity tests). In some cases lab testing is crucial if dietary changes are to be effective. In some situations nutritional supplements and herbal medicines have a clear role alongside diet. The term ‘doctor’ originally meant ‘teacher’, and in making dietary recommendations for my patients I spend considerable time explaining the reasons behind the changes. Knowledge, as they say, is power. Empowering patients is what it is all about and is why I run workshops and talks. My Presentations are thoroughly researched and fully referenced. 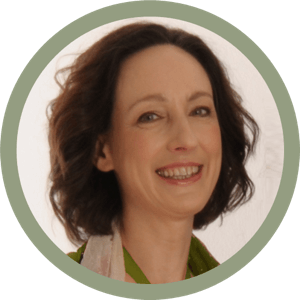 I cover nutrition, herbal medicine and clinical approaches to specific diseases. Thank you very much for another spellbinding talk! I learnt so much – literally food for thought. Thanks for all the effort you put into the research and presentation. Many congratulations on your talk last Saturday – you certainly excelled yourselves and my 5 pages of notes are testimony to that!! The Organic Acid Test is an invaluable means of identifying certain bodily and microbial metabolites from a urine sample as well as break down products of certain vitamins and nutrients. It is a bit like taking your car to the garage, having it put up on the rolling road and having the exhaust materials analysed to work out how the engine is functioning. From a simple urine sample this test identifies 75 different compounds and their origins and interprets them, significantly aiding the clinician in diagnosis and therapeutic approach. These compounds include waste products from your own cellular functions, and from the cells of undesirable microbes that may have taken up residence in a patient, such as yeasts, fungi and bacteria. These microbes produce their own waste products and by identifying them one can obtain great insight into several key areas of health. It also identifies disruptions in the ability to produce certain neurotransmitters such as dopamine, which can guide treatment greatly. I will often suggest this test in cases of autism and similar conditions in that spectrum, in chronic gut disorders, which often have tenacious yeast infections, or in certain other situations whereby symptoms persist and have not responded to sensible measures already taken. Diagnostic tests of this ilk are extremely useful in my experience.